President Trump recently announced his intentions to move the United States Embassy in Israel from Tel Aviv to Jerusalem, thereby recognizing Jerusalem as the official capital of Israel. The purpose of this article is to give you a brief overview of what this decision means and why it matters. To effectively explain the significance behind the President's decision to move the US Embassy to Jerusalem, you first must understand why Jerusalem is such an important city. Jerusalem is a city inhabited by Jews, Muslims, and Christians and is religiously significant to all three of the world’s Abrahamic faiths. It is home to dozens of meaningful religious sights to Jews, Muslims, and Christians. 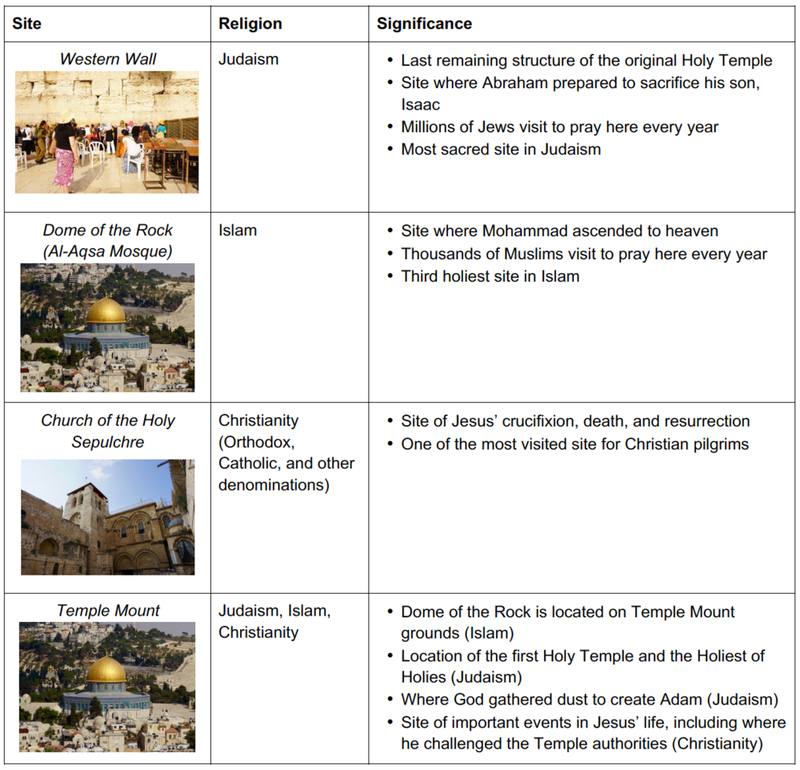 The Old City of Jerusalem is divided into four quarters: Jewish, Muslim, Christian, and Armenian. In addition to the fact that here are no physical boundaries separating the different quarters, the Old City is incredibly compact. This means that religiously, culturally, and socially diverse people are almost living right on top of one another. Living in such close quarters creates a palpable sense of tension in the city, which sometimes escalates into violence. Because Muslims, Jews, and Christians live side-by-side in Jerusalem, religious and political tensions often turn violent. Moving the US Embassy from Tel Aviv, a city that experiences much less violence, to a city that experiences so much would undoubtedly put the lives of American diplomats at risk. In the meantime, the security situation within Israel and Palestine remains precarious. Angry protests have the potential to lead to skirmishes or even full-out war. Hamas, the Palestinian terror organization that currently controls the Gaza Strip, has called on Palestinians to launch another "intifada," or uprising against Israel. Jerusalem's Damascus Gate, seen here in calmer times, has been the site of angry protests in the days following President Trump's announcement. However, opposition to the move remains high within the international community and it is very unlikely that any other countries will follow President Trump's example and move their own embassies to Jerusalem or officially recognize the city as Israel's capital. Your email address will be kept confidential and I will never spam you.